Italian Lifestyle Photos - Only in Italy Enjoy! I take photos everywhere I go in Italy. I find beauty on a narrow street and tranquility in the setting sun, but I also seem to be drawn to unique circumstances, which are part of the Italian lifestyle. 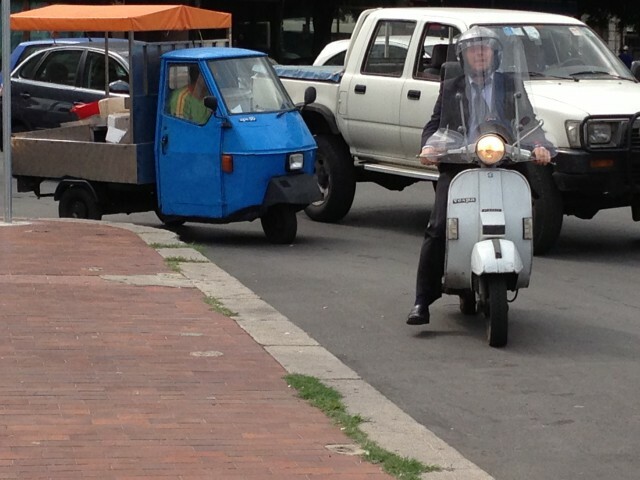 These situations in Italy depict the Italian lifestyle, and most of the time, make me smile. I hope you enjoy these photos and maybe even find the humor as did I. You gotta love it…it’s Italy. 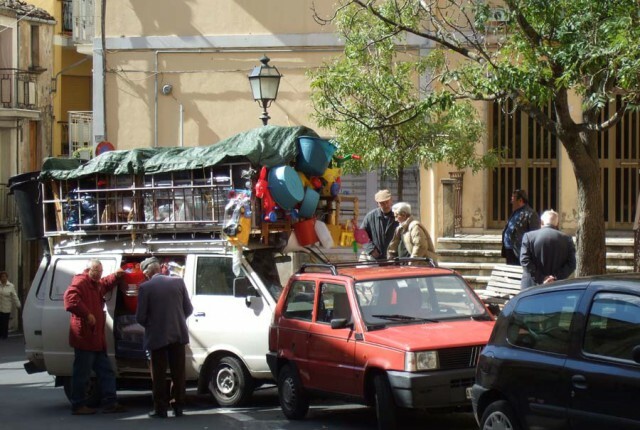 Park anywhere you can….an example of sidewalk parking in Catania…no problem. Common sights in Rome and many other cities are sidewalk condom vending machines. 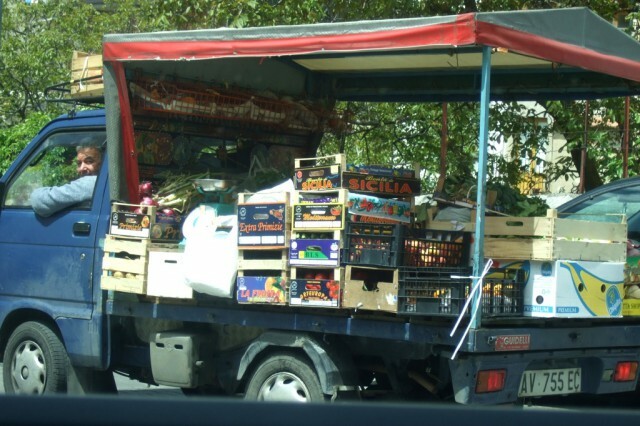 A delivery truck loaded with household goods draws the locals from their homes in Cesarò, the Sicilian village of my grandparents. “Il dolce far niente” in Siracusa. These men know how to take it easy. Translated to mean “the sweetness of doing nothing,” this is one of my favorite Italian traditions, where sitting around doing nothing is actually an event, and one that is viewed as something positive. Traffic in Rome…Cross when you can. There are no real rules. 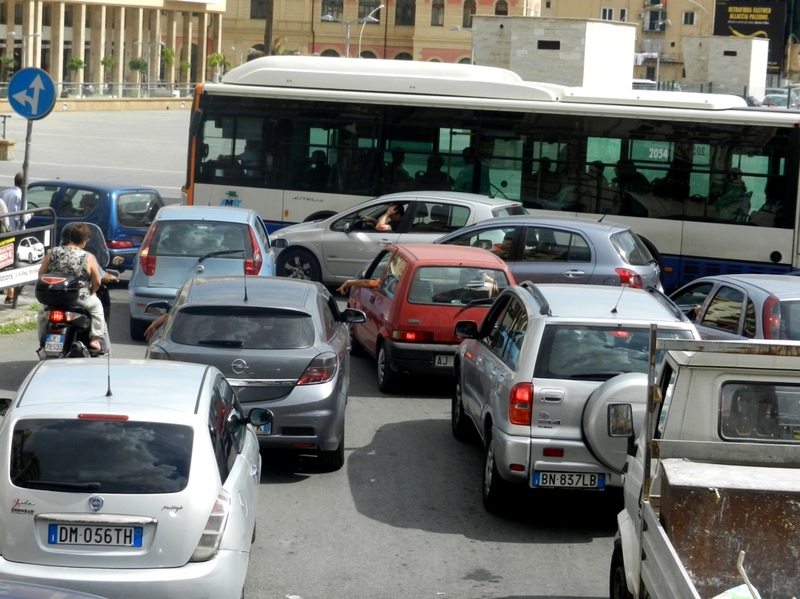 More free-for-all in traffic patterns..this time in Palermo. The locals take it in stride. This woman in Rome smiled as I asked for permission to photograph her while she cleaned her beans outside on the sidewalk in Rome. No overhead here with this produce for sale right off the truck. Can it get any fresher than this? Great pics. Would also like to know what camera you use. Yes yes yes great post Margie. I saw a lot of that sidewalk parking on Florence. And spot on with Rome traffic and crossing a street. Kind of like a game of dodge ball on a more dangerous field. Fun post!! Thank you Rae-I knew you’d be able to identify with the Rome traffic. Italy is so beautiful we can forgive it for everything, except maybe the service at the post office…anything official actually. You capture Italy in its good and bad the best, Margie! 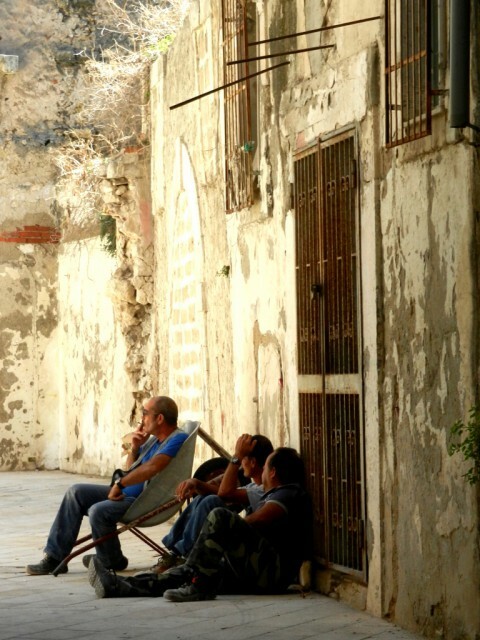 Great photos, I love how you capture everyday life and share the “real” Italy with us all! I remember being driven across Catania once, being astonished by the traffic, the lack of rules, and that somehow it actually worked! I love the condom machines. When you absolutely, positively gotta have it now! Well, it is Bella Italia. . .
Italy as only the Italians can live it. Loved this while living there for six years. Grazie for reblogging my post! How lucky for you to have lived in Italy for 6 years!!! You have to love the Italians. The first time we went to Italy our tour guide in Rome told us to be careful crossing the street because a red light is only a suggestion. We saw a car parked on the wrong side of the street, facing the other direction.. We have made more trips back with friends and always the men are sitting on a bench, cafe or playing cards..we are the women, oh in the house cooking. Lol ..When in Palermo our hotel manager told us to park our car in a gated parking lot and to take the bus or walk, you don’t want to drive in Palermo, hum, we are from New York..we took his advice..love the produce truck, we had a produce truck who came to our neighborhood, as well as the knife sharpener, good memories..there are many sites I love in Italy and take many pictures.. I have a love affaire with Italy, oh did I mentioned I am second generation Italian American..I love seeing your photos, videos, articles, would love to relocate to Italy…maybe someday. thanks for making me smile: right off the truck in New Jersey would be translated to it ‘fell off a truck’ ……………an inside joke for obtaining something at a great price. Thank you Lee…You made me laugh! Wonderful photos and sum up so much of Italy and why I love it. Particularly like the ‘il dolce far niente’. People are always so busy and it’s important to sometimes be still. Thank you so much, Tony. I’d love to see them! I especially like anything to do with Italians and cars.